yourFXguide-Volume based trading strategies compose a major part of technical analysis of stocks market. The traders of other financial instruments always feel lacking of real time volume data. In case of forex market, no real time volume data is available that draws the big picture of the traded volume. Open interest is may be the only set of data that tells us about the big picture of the volume traded in forex market. According to investopedia, "Open interest is the total number of open or outstanding (not closed or delivered) options and/or futures contracts that exist on a given day, delivered on a particular day." The definition stated above is little complex for the beginners to find out "What is Open Interest? 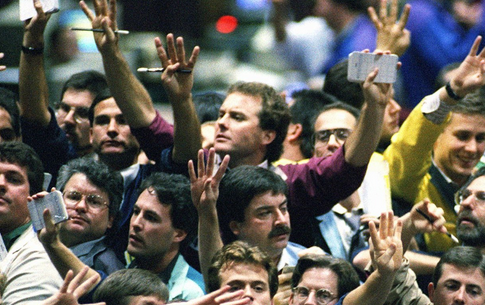 ", but my simple understanding about open interest is that it is the total number of all open contracts by all reportable traders and some non reportable traders in futures and options markets. However, currency traders can use open interest as an alternative to volumes traded. Okay, at this point, let me explain how forex traders can use open interest to analyze the market sentiment. Not only for sentiment analysis, but open interest can also be very useful to make market forecasts. In above illustration, I presented how open interest of euro currency were changed in last six years 2011-2016. This kind of historical picture of open interest can help the traders to predict when the open interest can be changed and which direction. Generally, the historical picture of open interest is not that much important as the historical picture of long or short positions. Anyways, Let see how changes in open interest can be applied to understand market sentiment. In above illustration we can see four possible relationships that can be found when we compare changes in price and changes in open interest. From the relationship between price and open interest, we will try to understand market sentiment. Both price and open interest are rising: If both price and open interest are rising, it indicates that market sentiment is strongly bullish, and market is about to rise. 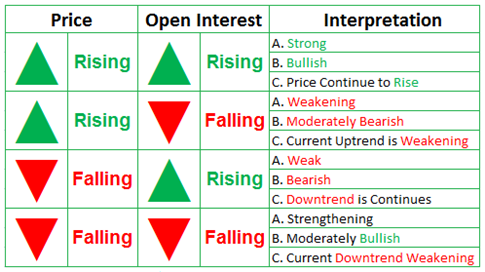 Price rising, open interest falling: When price is rising and open interest is falling, it indicates that current uptrend is weakening, and market supposed to be moderately bearish. Price falling, open interest rising: When price is falling and open interest is rising, it indicates that down trend will be continued, and bearish sentiment is increasing. Both price and open interest are falling: When price and open interest both falling, it indicates currency downtrend is weakening, and a reversal is about to be seen. Above stated rules are not any mathematical formulas, so some situations can be found where these rules may not be seen valid. Some of the situations when the rules may be fail are given below. When any strong economic or political news are released, market sentiment could be dramatically changed . When open interest reaches a historical highs or lows. 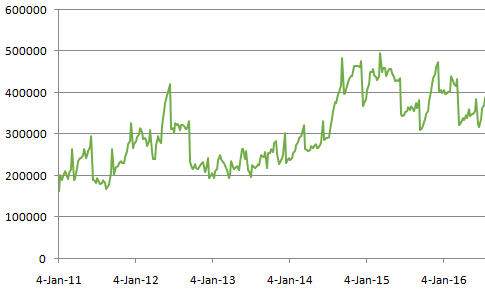 Analyzing open interest is just a dimension of cot report analysis. If the open interest analysis can be applied with other techniques of cot report analysis, traders can find better result.